Black Partridge honored Sierra Bullard of Washington, Illinois at a recent Black Partridge Daughters of Americana Revolution meeting. Sierra is the daughter of Jim and Angie Bullard. Sierra entered the Junior American Citizen (JAC) poster contest. The theme this year was "100th Anniversary of World War I-Service on the Homefront." We had 30 JAC Groups sponsored by the Illinois Chapters. 544 children participated in the Art contest which could have been stamp, banner, poster, or photo. 83 children participated in the Creative Expression contest which could have been writing a poem or short story. 92 children participated in the Community Service contest. Illinois had 136 first place state winners this year and each student was presented a certificate and a JAC pin. Illinois had 127 North Central winners and each was presented with a certificate. Illinois had 123 National winners which included 5 Honorable Mentions, 7 thirds, 5 seconds, and 106 firsts. The National winners were presented with medallions and certificates. 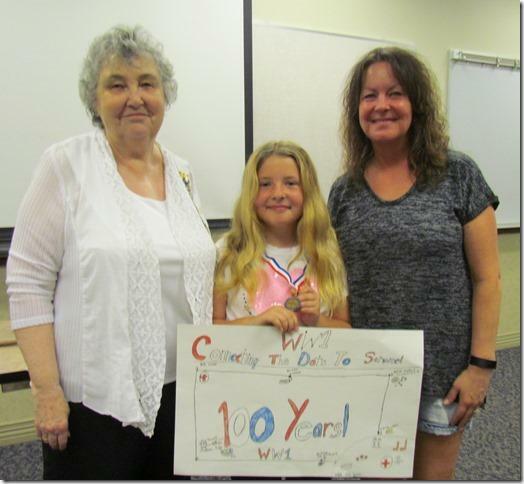 Sierra earned a first place for 4th graders at the State level, North Central Division level, and at the National level. Kenda Bond, the State JAC Chairman, presented Sierra with her awards.